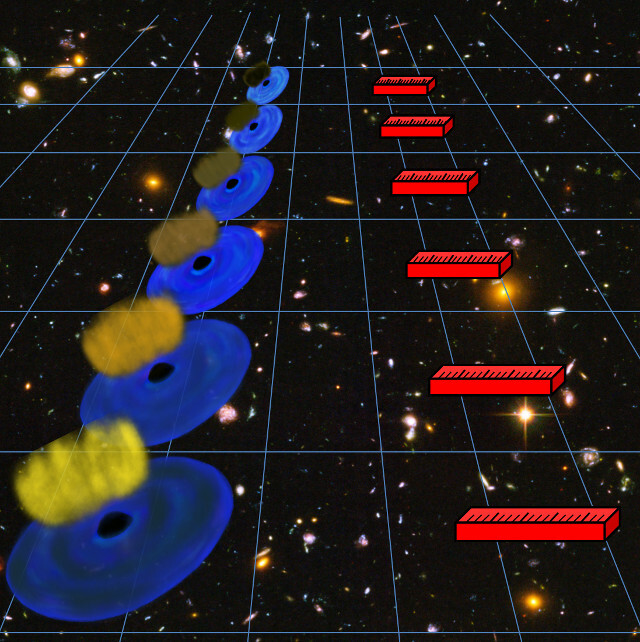 The problem of the universe expansion has become more complicated when the observations showed with repeated confirmations that it’s accelerating. To explain this phenomenon the existence of dark energy was hypothesised but if it really exists, its nature is still unknown. To try to better understand the nature of the universe, various methods were used to measure its expansion, but a discrepancy was found between a measurement published last year based on observations of type I supernovae with Hubble and Gaia space telescopes with a value of 73.52 ± 1.62 kilometers per second for megaparsec and the calculation based on the cosmic microwave background radiation (CMB or CMBR) applied to data from the final release of ESA’s Planck Surveyor space probe data with a value of 67.4 kilometers per second for megaparsec with a margin of uncertainty that is less than 1%. In 2015 Guido Risaliti and Elisabeta Lusso published in the journal “The Astrophysical Journal” their demonstration of the validity of a technique based on the relationship between the X-ray and ultraviolet emissions of quasars. The two researchers used a sample of 1138 quasars using various datasets including X-ray observations made with ESA’s XMM-Newton space telescope. Type Ia supernovae have been used as cosmic tracers for years, but quasars, active galactic nuclei powered by supermassive black holes, are even brighter and this enables their use to measure the universe expansion up to a billion years after the Big Bang. Quasars have been used for this type of study by other researchers as well: for example the double quasars, so called because a gravitational lensing effect doubles their image, are at the center of an article recently published in “Monthly Notices of the Royal Astronomical Society”. A team of researchers coordinated by UCLA measured the universe expansion at 72.5 kilometers per second per megaparsec. The uncertainty margin is compatible with the measurement based on supernovae and is inconsistent with that based on the CMB. The team coordinated by UCLA is part of the H0LiCOW (H0 Lenses in COSMOGRAIL’s Wellspring) collaboration and includes Sherry Suyu, who previous led a research on the subject based on gravitational lensing effects. The results were reported in an article published in the journal “Monthly Notices of the Royal Astronomical Society” in January 2017, offering more results consistent with those based on supernovae. Guido Risaliti and Elisabeta Lusso obtained results consistent with those based on supernovae as well for objects of similar age but what emerged when studying the primordial universe suggests a situation that’s different from that predicted by the cosmological model that has the highest consideration, called Lambda-CDM (Cold Dark Matter) paradigm. It predicts that the density of dark energy is constant over time but the results of this research suggest that this is not true. For this phase of their research, Guido Risaliti and Elisabeta Lusso started from the data of over 7,000 quasars including those obtained with the XMM-Newton space telescope in 2017 about very distant quasars, seen as they were when the universe was about two billion years old. Other quasars, some of the oldest ones and others relatively close, were observed with NASA’s Chandra and Swift space telescopes. The image (courtesy Guido Risaliti, all rights reserved) shows an artistic representation of various quasars. In blue their ultraviolet emissions are shown while in yellow-brown their X-ray emissions are shown. Their comparison allows to accurately estimate their brightness and their distance to use them as “rulers”, shown in red. It’s early to say if this is the key to solving the problem of the discrepancy in the Hubble constant calculations and to correct the current cosmological models. It’s important because it indicates a way to make new measurements exploring hypotheses that will help to understand if dark energy really exists and the reason for the acceleration in the universe expansion.